OLK14 File Converter is a software which is specially designed to convert any number of OLK14 and OLK 15 files in different file format i.e. PST, MSG, and EML file format. 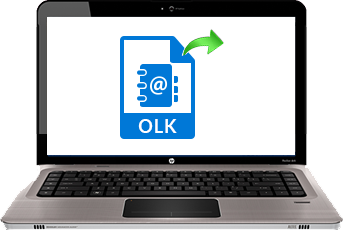 The attractive feature about OLK file converter is that it transfer OLK file to PST file format and make it possible to accessible on Windows MS Outlook platform. Option to export OLK files to PDF, HTML, Office 365, ICS & VCF. Emails and Calendars categories for OLK15message conversion. 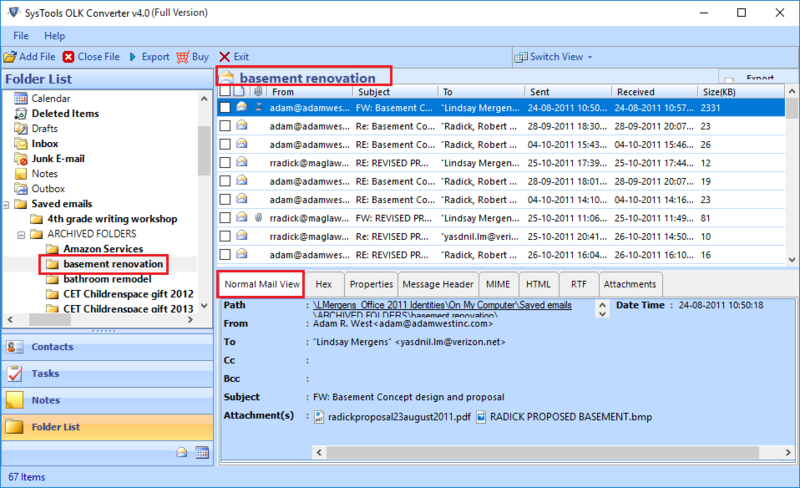 OLK 14Message Converter tool allows users to convert OLK 14 to PST file format. It is the tool that export OLK to PST format along with attachments associated with each emails. 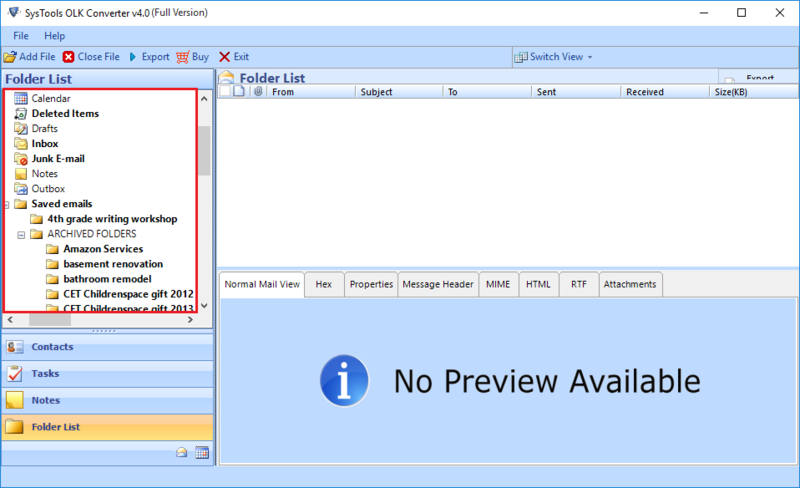 The attractive feature about this tool is that one can import olk14message to Outlook PST format with or without Outlook also. It is necessary to have Outlook installed on machine. With the help of OLK File Converter a user can easily convert OLK14Message to MSG & EML file format also. 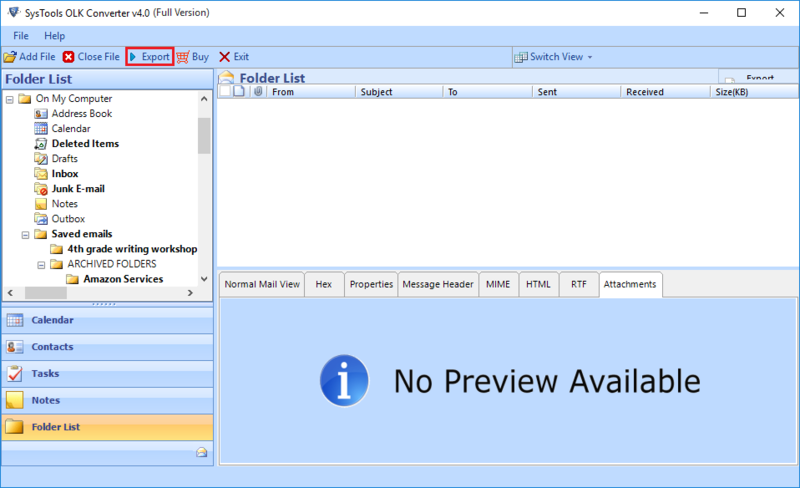 It becomes easy for a user to view it on any other supporting email application on Windows. However, the software is compatible with all versions of Microsoft Windows such as Windows 10/ 8.1/ 8 and all below versions. A user can easily perform OLK14Message & OLK15Message file conversion using OLK converter. There is no risk of loss of data during conversions. However, the software maintain the original formatting, data integrity and folder hierarchy intact. Apart from all this, a software is free from all type of malicious attack also. A user can easily convert selective file conversion also using this OLK14Message file converter. The software allows users to apply data based filter on OLK14 & OLK15 emails. One just needs to specify the To and From ranges in order to filter the set of message that a user wants to export. However, the software converts only those messages from OLK to PST, MSG, EML file format. With the help of OLK file Converter a user can add one as well as multiple files in converter to perform bulk conversion. A user can use this tool to export any number of OLK15Message & OLK14 Message to MSG, EML & PST file format at one also. However, a user can also add complete folder to OLK file Converter and export all at once. Now move complete mailbox details in MBOX File format also. This helps you to view details in MBOX File format supported client such as “ ThunderBird, Mac Mail”. Even export directly all emails, contacts, calendars, and Notes details into Office 365 with OLK Converter. Now save details of Emails stored in OLK File format into Portable Document File format using export options in OLK Converter. Also you can save details in HTML File format. When a user tries to save OLK14Message files to PST, EML & MSG, the software provides an option to save these file according to the selected name. It means that a user can save export OLK file at any desired location with any name of their choice. 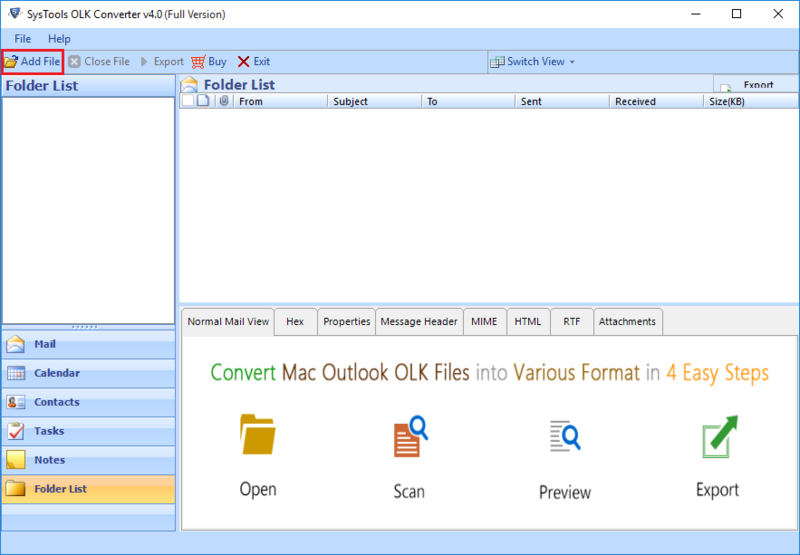 This OLK converter is especially designed for MAC OS which converts mac Outlook olk14message and olk15message to PST / MSG / EML file conveniently. 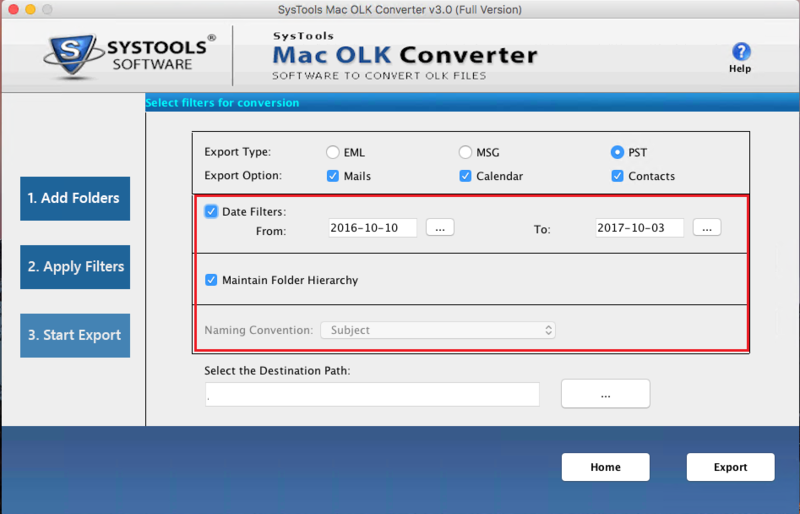 Mac OLK file converter tool has a very simple interface so that it can be easily deployed by a non-technical user also. Migrate MAC OLK emails, contacts & calendars to PST file. Date based filter option to convert emails of particular duration. Folder hierarchy of OLK file remains same even after exporting. 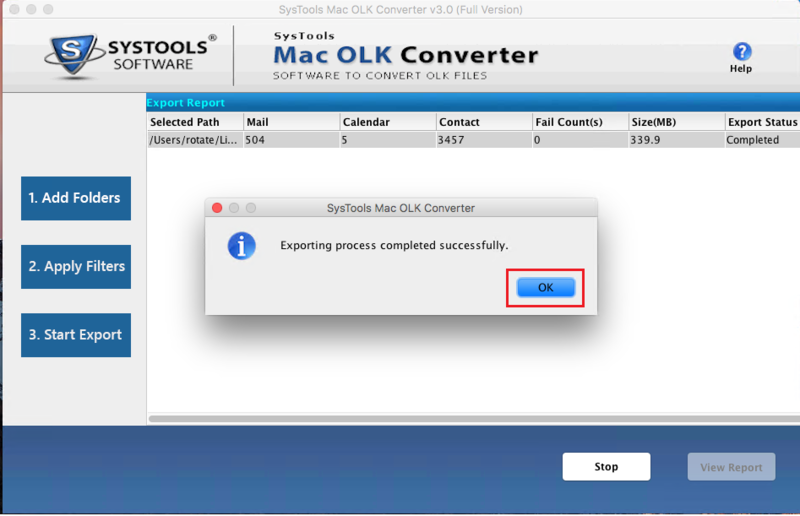 Supports conversion of Mac Outlook 2011 & 2016 OLK files. Compatible with latest versions of Mac OS. This Mac OLK converter allows to convert olk15message as well as olk14message to PST, MSG & EML files format. The tool will export the all OLK files items like emails, contacts, calendar to Outlook PST file and export olk emails in EML & MSG format. OLK Converter allows to add multiple olk14 or olk15 files and have ability to export them simultaneously. The software provides add folder option to browse to add multiple olk files, there is no restriction on size or number of olk files. While converting from olk15message or olk14message to EML or MSG files, the tool provides the multiple naming conventions option. User can save mac olk emails to any of the desired format for better understanding of exported emails. 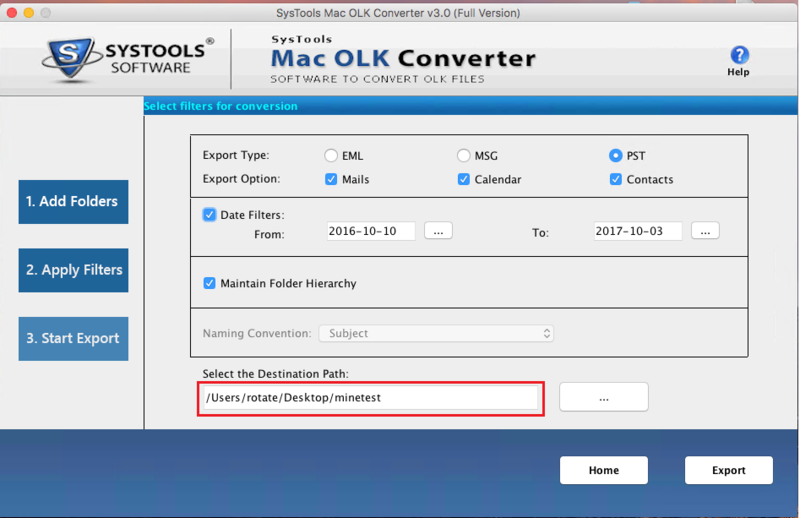 Mac OLK converter software provides the option to make selective conversion filtered accordingly datewise to save in PST / MSG / EML. The software will only export emails of that particular set duration (‘From’ to ‘To’). Mac OLK to PST converter tool assures to maintain the folder structure throughout the complete conversion procedure. This folder structure of exported olk files will be remain same even after converting it to Outlook PST file. The Mac OLK Converter is designed with such an interface that users will find it very simple and interactive to use without causing any trouble. It is supported by latest mac versions like Mac OS Sierra 10.12.13 & OS X Yosemite version 10.10.4. I was searching for the OLK to PST file converter from a long time and finally got this amazing utility named as an OLK14Message File converter. I must say that the tool is designed so well that it converts all my OLK file to PST format without any file size limitation. It gives me 100% satisfaction without any loss of data. Now I can access my Mac Outlook data without Mac. Thanks to OLK Converter team for developing this great software. The OLK Files are Outlook Address Book file that is developed by Microsoft for Mac Outlook email application. It is the file format used to store contacts information such as phone numbers, email address, names, organization data and other details These are the files of Mac email application and stored locally in the machine and can not be easily accessed directly in Outlook without the database. However, OLK files are Mac Outlook files and are not accessible on Windows platform. Therefore, to open and read them Windows OS, it necessary t convert them to some other file format such as PST, MSG, and EML. There are some situations in which a user needs to migrate from one platform to another such as Mac OS to Windows OS. In this case, one needs to export Outlook Mac OLK file to PST or some other file format like MSG, EML format. After converting OLK14message to MSG, EML, and PST format it becomes easy for a user to access them anywhere and on any supporting application a user wants. Thus, it is important to convert OLK file to EML format because it is helpful in case of corruption also and work as a backup file. As discussed above there is need to convert OLK file to some other file format so, a user can go for a third party tool available i.e. OLK Converter. The tool is designed in such an amazing way that it converts OLK15 file without any data loss. Moreover, there are multiple file formats supported by the OLK converter i.e. PST, MSG, and EML format. This software enables users to access the OLK files outside the Mac platform also. In addition, if a user wants can export convert multiple OLK files to some other format at once also.